Walking through a hay field or a field of tall grass, it can be difficult to see stones on the ground until you are right above them. The hay is the first and only thing that you see as you look forward or backward. If you were to pick up a stone and throw it straight forward in your path, it would probably disappear from your sight. However if you repeated this action enough and your throw was straight, the stones would knock over some of the hay and the previously thrown stones would resurface farther down the field. With enough repetition and accuracy, you could develop a path of stones that would rise to meet you as you walked. This is most definitely not the way that I take walks but it represents something that I aspire to do regularly. As we all walk through life, we have opportunities that come to us. We can only take opportunities in the present. The past is behind us and the future is beyond us. 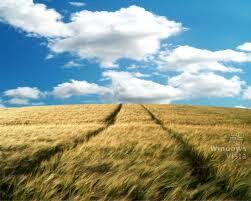 However much like the stones in the hay field, our present actions can effect our future outcomes. If we are consistently throwing stones of fitness forward, it creates a path that makes our journey easier. However when we throw the occasional stone, we usually cannot find it in the future because it gets lost in the hay. Consistently acting in the present is the only way to have an effect on the future. In order for you to get what you want out of life you need to be taking SADD (Simple Actions Done Daily). Just because something is simple, doesn’t mean that it’s easy. Going to the gym is a simple action but it’s not easy. However if you do that simple action daily, you are throwing stones forward. If you do a daily action long enough, then you will have a system that makes throwing the stones automatic. The path is picked up only to be laid back down in front of you like the tread of a tank. Start building the tread of your tank today.